Version 1.22 of introgress was released in January 2010 and is available from CRAN, the main repository for R packages. See Changelog below. introgress implements analyses that are described in Gompert and Buerkle (2009). The software and its use are described in Gompert and Buerkle (2010). Please note that while introgress does a fine job at summarizing and detecting variation in introgression among loci, it does not necessarily lead to strong inferences about the causes of the variation (e.g., detection of selected loci). For example, variation can arise due to genetic drift and does so commonly under certain reasonable conditions. For detecting expectionally differentiated loci, with less sensititivity to genetic drift, we suggest using bgc. Please see Gompert and Buerkle 2012 for a comparison of bgc and introgress. In both cases please be aware of the mutliple evolutionary processes that can lead to expectional differentiation. Gompert, Z. and C. A. Buerkle. 2009. A powerful regression-based method for admixture mapping of isolation across the genome of hybrids. Molecular Ecology 18: 1207-1224 (article). Gompert, Z. and C. A. Buerkle. 2010. introgress: a software package for mapping components of isolation in hybrids. Molecular Ecology Resources 10: 378-384 (article). Installing the package is simple. introgress will function on all operating systems for which R is available (Linux, Mac OS X, and Windows). Start up R. If you do not yet have R installed, instructions and downloads are here. Select a CRAN mirror that is geographically close to you and then download the appropriate software for your operating system. From within R, install introgress using one of the following methods (a or b). You may be prompted to select a CRAN mirror from which to download the package. This downloads and installs introgress, as well as a few packages upon which introgress depends. 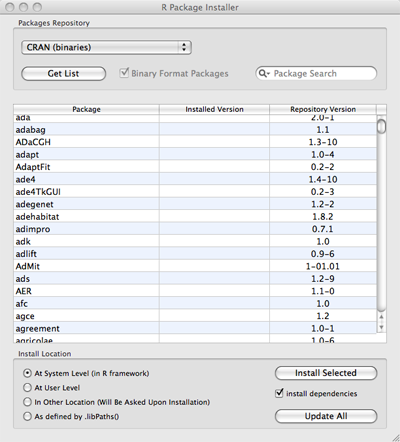 For the Mac OS, choose R Package Installer from the Packages & Data menu item. For Windows, choose Install package(s)... from the Packages menu item (see image below). On Mac OS, in the new graphical box that opens (see image below), press the Get List button. This will download a list of all available R packages. In the list, select introgress and select the Install Dependencies check-box below, and then press the Install Selected button. This will download and install introgress as well as a few packages on which introgress depends. On Windows, simply select the introgress package from the menu. With both operating systems, you might be asked to select a CRAN mirror for your downloads; select one that is geographically close to your location. If this and the preceding steps worked, you should be ready to begin using introgress. Please note that introgress utilizes the genetics package and the latter incorrectly warns that it is "obsolete". This warning can be ignored and will be removed in a future version of the genetics package. The following text files contain data to be used in the example analysis from Table 2 in the manuscript (Gompert and Buerkle 2010) that describes the software (AdmixDataSim1.txt, LociDataSim1.txt). The following is another example analysis and involves parental populations that share alleles. The code is in example.sim2.txt and should be used with the following data files: AdmixDataSim2.txt, LociDataSim2.txt, p1DataSim2.txt, p2DataSim2.txt. (Sept. 2009) With large numbers of alleles per locus (~45 alleles), prepare.data may run out of memory as it attempts to find combinations of alleles for the allelic classes. This will be fixed with a more efficient algorithm in a future version of introgress. Meantime, alleles that are known to be restricted to one of the parental taxa could be collapsed manually by the user, to reduce the number alleles that prepare.data encounters. CRAN mirrors may at times not be synchronized with the master CRAN in Austria. If you find that a certain package cannot be found on the mirror you have chosen, it is likely that you can find it by choosing another CRAN mirror that is nearby. R Documentation -- R is a comprehensive environment for statistical computing and has many components. These components are documented in R's Help system, in online documents and manuals, and in many books. Have a look at the Documentation entry in the left sidebar on the R Project page. We have tested introgress under a number of circumstances, with different data sets and operating systems, but surely there are situations that we have not anticipated. We welcome your feedback and will do what we can to assist you with the software. If you have a question, a feature request, or encounter a bug, please consult the help pages for introgress, the manuscripts that describe the method and software and thoroughly investigate your concern or problem. If you are interested in a new feature, we encourage you to consider writing it and contributing it to the package. If our assistance is required, please send an email and provide as much information as possible. Over time we will likely build a FAQ. What operating system did you use (Windows, Mac OS, linux, etc., as well as version of operating system), what version of R and what version of introgress? Can you provide code and data that will allow us to reproduce your problem? Previously, large datasets could exhaust the available memory. We have modified the functions for significance testing to utilize less memory. Fixed a bug in the parametric approach to signficance testing. This bug has been in all previous versions of introgress and affects the parental allele frequencies that are used for simulations in the genomic.clines function. The bug was not present in R code we used for previous publications. The compare.clines function now allows for significance testing using a permutation procedure. The genomic.clines function now allows for estimation of genotype specific deviations (i.e., quantile for the total probability of a genotype relative to the total probability of that genotype from permuted or simulated data sets). clines.plot allows for genotype specific deviations to be reported (+, - , or blank) above plots, with a user defined significance threshold. The relevant documentation has been updated to reflect these changes. The documentation for prepare.data now explains how missing data should be entered. This material is based upon work supported by the National Science Foundation under Grant No. 0701757 (Plant Genome Research Program). Any opinions, findings and conclusions or recomendations expressed in this material are those of the authors and do not necessarily reflect the views of the National Science Foundation (NSF).